Are you surrounded by gossip and slanderous words? 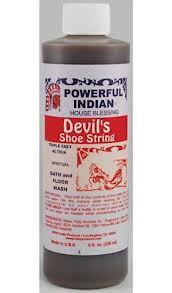 Use The Lucky Candle’s Devils Shoestring Bath and Floor Wash to trip up the devil and keep evil from reaching you, whether you use it on yourself, your home or at your place of work. 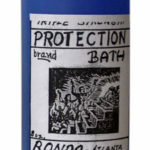 Use Devil’s Shoestring Bath & Floor Wash for protection against all evil. This is known to be the best shield against negative energy, evil spells and hexes. It is also used for good luck in gambling, and to give a positive result when trying to find a job. 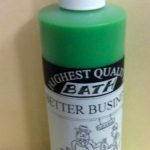 Specially prepared bath & floor wash in 8oz plastic bottle. 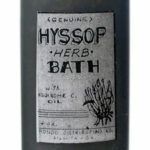 For Bath Use – Fill your tub with water, add 1/2 of the contents into the water and soak in the tub for 15 minutes while concentrating on your desire. Use for two baths. For Floor Wash Use – Add half of the contents into a gallon of cold water and mop your floors from the back of your home to the front. 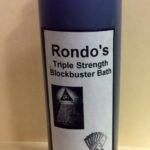 Use for two floor washes.